Eight Treasure is a small neighbourhood restaurant that attracts a continuous queue of zealous diners. The shop could definitely accommodate more people but the owners limit the tables to an auspicious ten. Is it because they couldn’t afford any more furniture? Or is this a sign of arrogance? I’d like to think that it’s an assurance of quality. After more than 15 years in business, nothing much has changed: rattling air-conditioners, dun-coloured wall carpets, and the profoundly aromatic pork ribs that everyone dreams of finding at a Chinese restaurant. A peek inside their kitchen revealed a legion of woks, blasted by flames that produced the required wok hei to dish up their famous nam yue (red fermented beancurd) pork ribs. No piece of crackling pork was cast adrift without a salty buzz from the beancurd equivalent of aged cheese. Salted egg prawns – shelled to resemble prawn cocktails and coated with duck egg yolk – were fried until they curled into golden bite-sized balls. The chef didn’t stint on the salted egg, which was good, but I wish the prawns hadn’t come at RM6 each. Eight Treasure’s straight-up Chinese dishes have the most conviction. The flavours of their Guang Xi stuffed tau fu pok drew on a childhood experience spent in my grandmother’s kitchen. I’m well aware of what Guang Xi tau fu pok should taste like, and Eight Treasure’s version nailed it. 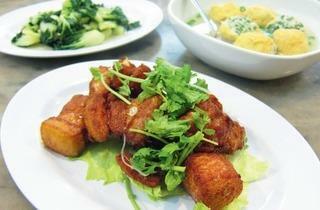 Fish paste, melded with fatty and lean pork bits, is jammed into the hollow fried beancurds before being boiled. Riddled with chopped kuchai leaves and spring onions, the tau fu pok soaked up the flavourful broth they came submerged in. The dish was irresistible, and everyone knew that, because these pockets of goodness were bobbing on nine tables out of ten. 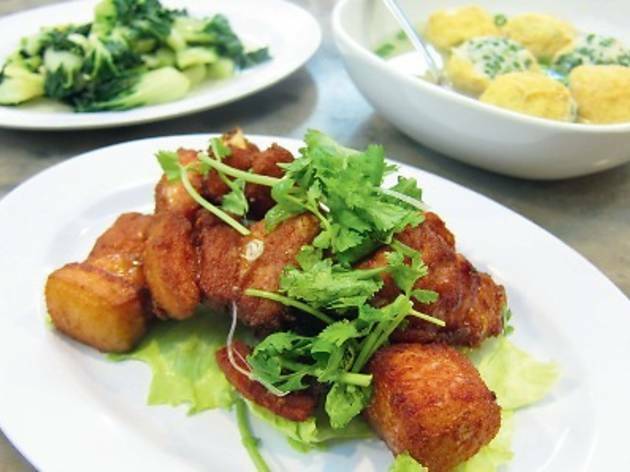 The menu isn’t diverse enough to please everyone but it reads as a strong statement that the food is, and will always be, modest traditional Chinese dishes. Eight Treasure doesn’t pride itself on inventiveness or fancy presentation (the garnishes are never gratuitous) but the food exudes the polish of a downtown eatery. Keep the broken air-conditioners, keep the hideous wall carpets, and keep the tables to ten if that’s what it takes to trot out good food. The restaurant is gaining loyalty steadily, and it already has mine.